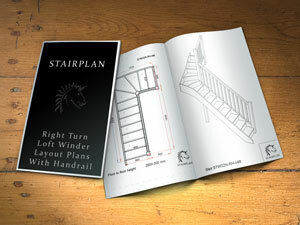 In order for us to find out the staircase layout you require we have a number of staircase plans online, the plans on this page a Single winder Staircase layouts. These sizes are not fixed they are flexible we can alter the widths and the rise of the flights but remember if you need to go higher we will need more room to keep your 42 degree pitch, use these as a guide. 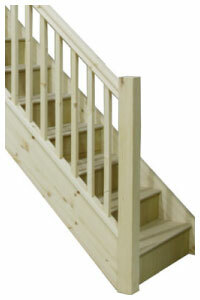 If you need your staircase to go the other way simply let us know you need to opposite hand when Ordering. 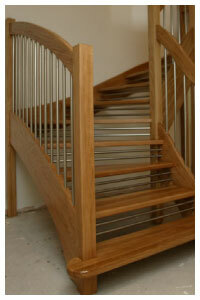 Visit the Staircase Showroom to choose the style of your new staircase. the Pine square specification is the entry level specification with pine 32mm square balusters and 90mm Square Newel posts. Oak Openplan Staircase with our europan style handrail and twin riser safety bars. 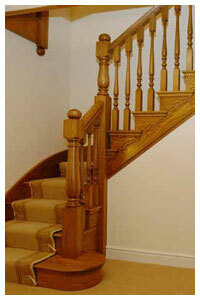 For Carpeting go for Oak Strings, Engineered Pine Treads and Plywood Risers and then your handrail parts in Oak. For All Oak - Oak Strings, Oak Treads, Oak Faced Plywood Risers, and Oak Handrail Parts . The staircase drawings on our website are a guide to help you decide on the staircase layout you require, all our staircases are made to measure so give us the dimensions you have and we can give you a quotation for exactlty what you need.